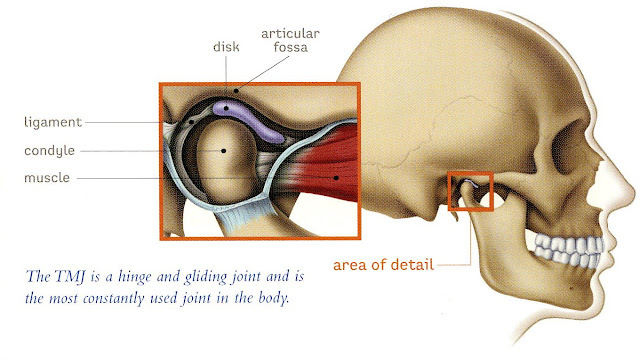 The most complex joints in the body are the two temporomandibular joints (TMJ). These joints are located in front of the ears and connect the lower jaw (mandible) to the temporal bone of the skull. Temporomandibular joints are complex, both rotating and sliding, and involve numerous components: muscles, nerves, tendons, ligaments, bones, connective tissue, and teeth. Other health issues have to be ruled out before a TMJ diagnosis is considered. TMJ patients may see a multitude of providers that include primary doctors, specialists such as ear, nose and throat doctors, chiropractors and dentists before a diagnosis of TMJ is made. Not all causes of TMJ are known but genetic, hormonal, and biological factors can influence the development of TMJ disorder. Factors that can contribute to developing TMJ are teeth clenching or grinding of teeth, nail biting habits, an injury to the area, infections, previous dental treatments, or auto immune disease. Most TMJ patients report a hypersensitivity to pain. TMJ is not recognized as a specialty in either the American Dental Association (ADA) or the American Medical Association (AMA) due to the lack of basic or clinical science; and most insurance companies will not cover treatment for TMJ because there is no standardized method of treatment. There is also no empirical evidence that TMJ can be prevented by any treatment. However, there are some treatments that seem to help diminish TMJ pain. Many TMJ patients are fitted with a mandibular repositioning (MORA) device. Though this is a widely used treatment option; the scientific validity of the device is unproven. Over time, some symptoms go away without any treatment. Others seem to improve temporarily with some self-care practices. Other treatments include using a stabilization splint which is a nightguard that is fitted to the patient’s teeth. Over-the-counter bite guards are not recommended as they may actually increase pain if they shift the teeth.